Come with me to the 4th dimension! 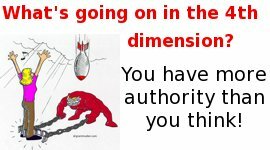 How many dimensions are you living in? This week’s blockbuster video is in 3D! I have the glasses so you don’t need to get them. Most people are only living in 3D. They don’t realize that man is the only creature on the planet designed to live in 4D. The 4th dimension is actually more real than the other 3, you just can’t connect to it with your 5 senses. It has a constant influence on you whether you are aware of it or not. It actually has more influence on you than what you can touch or feel because it affects your thoughts, moods and behaviors. Feeling creepy now? So what is the 4th dimension and how can you get there? Could it help you at work? Do you think that legal insider tips could be useful? Understanding the 4th dimension will revolutionize every part of your life. Just click on the video and start your voyage to the 4th dimension. To live a transformed life you need to live in all 4 dimensions. Share the transformed life. Send this to your friends so they can join you in the 4th dimension. How do you stay in all 4 dimensions? Just leave your comments in the box below. PS: Do you need a coach? Are you feeling stuck mentally or emotionally and need some advice or encouragement? I am now able to take a very limited number of online or phone personal coaching appointments. If you want help living a transformed life, just click here for more information. Visit our video library. There are 36 life changing videos waiting for you. You mini-teachings are super and very encouraging. I love the humor! Thank you! Blessings and may the Lord bring you “spring and fall rains” to bring increase! It is very encouraging listening to how you look at everything, it definitely makes me think, and I do try and take God everywhere with me, but there are times I try to do things my way without looking to Our Lord Jesus who is right beside us and asking God what He would do. Yes I also like your sense of humour and look forward to hearing from you again. I love the glasses. I will keep my eye out for that fourth dimension. Thanks for reminding me to constantly operate in the 4th dimension, I’ll just remember those glasses and it will keep me in the “supernatural” dimension. Thanks also for the Coaching, it’s great to connect with you from the other side of the world… it’s as if we’re sitting on your porch enjoying a cup of coffee. Your wisdom is extremely helpful. Great comments. It’s always a challenge to keep reminding ourselves of the spiritual dimensions to everything we do. It’s just too easy to fall back into old habits. Awesome. Entertaining. Fun. Thank you – – nicely explained, great concept. When I gave my heart to Christ it was like suddenly living in a parallel universe. Before it happened, I particularly remember driving through Quebec and wondering who on earth was putting all those crosses on the top of obscure mountains??? And Why??? What were they thinking?? Now I’m the one who wants to put a cross on the top of every mountain. It’s like God put them there as an invitation to cross over to the parallel universe – – so close and yet so far. Then suddenly I was there – – in the parallel universe where everyone lives life in 4D! Yahoo! I find living in a 4th dimension a very rewarding place to be. It is hard to explain how it happens but one time, at work, I waited on customers while praying in my spirit for a co-workers son who had been injured while my daughter was baby sitting. My spirit prayed for the boy until she returned to work to let us know that it wasn’t anything serious and he would be O.K. Those experiences are so rewarding. I pray that everyone can start to live that way. God bless. Excellent Grant. This talk reminded me of Ian Thomas’s book “The Saving Life of Christ” and also L E Maxwell’s book “Christ Crucified.” Yes, it is one thing to know these things and quite another to allow Christ to be Lord in our lives at all times. Thank you doctor. It’s exciting stuff, isn’t it. I find it amazing that I can lose a consciousness of God from one moment to the next. Prayer is the biggest help for me. Not formal prayer but talking to God, from time to time ,all day long. It’s wonderful! If only people would realize that it’s not about religion, but about an intimate relationship with our creator. Now, if I could only operate in the Spirit all of the time, instead of trying to solve problems on my own. Oh well, still working on it. I find that if I keep on my 3D glasses it reminds me to stay in the 4th dimension. Some people look at me funny though. They just don’t understand the significance. I just try to picture my self working with Father on things, like a son who is doing a job with his dad in the back yard. But sometimes I dont, I think part of the re-newing of your mind is just letting the Holy spirit train your mind to think like this. I think that we partner in this by filling our mind with things that help remind us of this. That’s a great visual image. It takes practice to continuously see ourselves working and walking along side the Father. Always working on this…I am so blessed to have found your website! I am almost finished reading your book, Emotionally Free. As soon as I read the last page, I think I’ll just start over again. It’s that powerful! I pray constantly for “renewing of the mind”, for God to fill me with His thoughts. Thanks Miriam. I’m glad you find the book and web site helpful. You can let others know about these resources. We’ve got to get the word out that Christians can be set free! A childlike amazement at the unpredictability of life and being part of the mystery of finding my life hidden in Christ helps me walk in the forth dimension. I find great comfort and rest in knowing that I can do nothing apart from him.That takes the pressure off of me to have it all together and frees me up to be available to whatever Christ is up to that day in the neighborhood. I am glad the battle belongs to the lord, but am happy to give what he gives me to pass on to others to further his goals in many lives. Protecting the peace and joy he gives me allows me have some to give others. That feels fourth dimensional to me. Thankyou for your faithfulness to Christ to give of what he has given you. Yes David that is totally 4th dimensional. Thanks. Thank you for the reminder for the 4th Dimension. Dude, isn’t the fourth dimension time ?